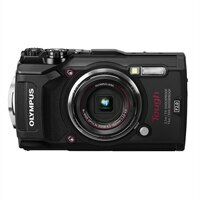 Olympus Tough TG-5 Digital camera compact 12.0 MP 4K / 30 fps - 4x optical zoom - blackBuilt for adventure. Designed to bring back amazing looking souvenirs. The Tough TG-5 is packed with pro features that help you nail bright, crisp outdoor shots even in challenging conditions. You'll find imaging firepower that's optimized for shooting action. The TG-5 has the imaging power you need to never miss a shot. Its specialized image sensor and incredible processor minimize noise to produce sharp shots in all lighting conditions, even underwater and in low light. Capture moving subjects without blur. Whether you're shooting on a rafting trip or in a snowboard park, you're focused on getting awesome shots. Your camera should take care of itself. The TG-5 does - no protective housing needed. It's waterproof and shockproof. With TG-5, incredible still shots are only half the story. Simply turn the TG-5's dial to the movie icon to capture Ultra HD video with spectacular detail just as you remember it - the colors in a sunset, the coral on a reef, a skier carving a mountainside. Built for adventure. Designed to bring back amazing looking souvenirs. The Tough TG-5 is packed with pro features that help you nail bright, crisp outdoor shots even in challenging conditions. You'll find imaging firepower that's optimized for shooting action.